Did your team advance into the NCAA men&apos;s basketball tournament? Congratulations! You&apos;re going to love your time in Columbus. And there are still limited tickets available here! 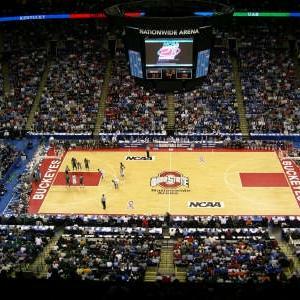 Here&apos;s everything you need to know about your tournament weekend in Columbus. All games will be played at Nationwide Arena, which makes staying downtown desirable. The region&apos;s largest cluster of hotels is two blocks away from the Arena. The Arena District (directly around Nationwide Arena) is full of bars and restaurants - we&apos;ve even arranged team bars (which also all have great food selections) so you can cheer along with fellow fans! Check back here on Saturday, and we&apos;ll have team bar listings for the advancing four teams. There are games on Friday and Sunday, which means you have all day Saturday to see Columbus! Short North Arts District: Take in one of the nation’s most envied arts districts with an afternoon of unique local shopping at Tigertree, Homage and Rowe. Browse through dozens of eclectic galleries and grab quick bites from standout restaurants like Gallerie Bistro, The Pearl and Rigsby’s. Downtown: Just a few blocks south of Nationwide Boulevard, downtown Columbus’ Gay Street is buzzing with activity. Grab a coffee (Café Brioso) or tea (Zen Cha Tea Salon) and browse local shops, like Zeroz. Hop on the free CBUS downtown circulator and head a few blocks south to get a bite at DeNovo, Dempsey’s or Little Palace. German Village: German Village, one of the nation’s largest historic districts, is worth a visit just for a stroll, but you’ll also find fine dining at G. Michael’s and Lindey’s. Breakfast at Skillet or the German Village Coffee Shop is a must-do. 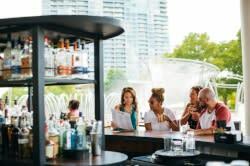 Brewery District: In the Brewery District, Brick An American Kitchen, El Arepazo Tapas and Wine and Westie’s Gastropub are all great choices for a relaxed but delicious meal. Catch a show at Shadowbox Live and follow it with a draft next door at World of Beer. For basics on transportation, visit getaroundcbus.com. Our free CBUS downtown circulator will have late-night hours during the weekend -- until 3 a.m. on Friday following the games -- and can get you around the Short North, the Arena District, Downtown, German Village and the Brewery District. If you&apos;re at all into coffee, you&apos;ll want to check out the Columbus Coffee Trail! Not only will you see why Columbus has the most creative coffee scene in the region, but you&apos;ll also get a cool T-shirt out of the deal! For more information while you&apos;re here, find one of our three visitors centers (one across from the arena at Nationwide and Neil, one in the convention center and one at Easton Town Center) and we&apos;ll help you customize your trip.